Just like humans, older horses may show signs of slight stiffness in their gaits; very often this is caused by arthritis. Arthritis is almost unavoidable as a horse ages, but early diagnosis and conscientious care can slow its advance and minimize pain. Arthritis is a degenerative joint disease involving the breakdown of soft cartilage between the bones; the disorder can cause pain and lead to lameness in horses. Arthritis in horses also goes by the names DJD, equine arthritis, joint disease, osteoarthritis, OA, ring bone, and bone spavin. In its early stages, arthritis may appear as a slight stiffness that the horse works out of once it is warmed up. In the joint, the cartilage material is breaking down, but not repairing itself efficiently. Eventually, as the cartilage becomes more damaged, the bone beneath the pad of cartilage becomes damaged as well. The horse will then experience more discomfort and there may be heat in the joint as inflammation occurs. In more advanced cases, small bony growths called osteophytes may be seen under X-ray and may be felt around the affected joint. As the disease progresses, the horse may experience more discomfort and lameness. Arthritis is caused by the slow wearing of cartilage— the tough, flexible tissue that is the shock absorbing and sliding surface between the bones that meet at a joint. Over time, compression and stress wear away the protective cartilage. Arthritis most commonly occurs in the weight-bearing joints of the legs and in the hooves. Extra stress or injury to any joint can lead to arthritis. Pain occurs as the cartilage thins, resulting in pain, inflammation, stiffness and eventually, lameness. 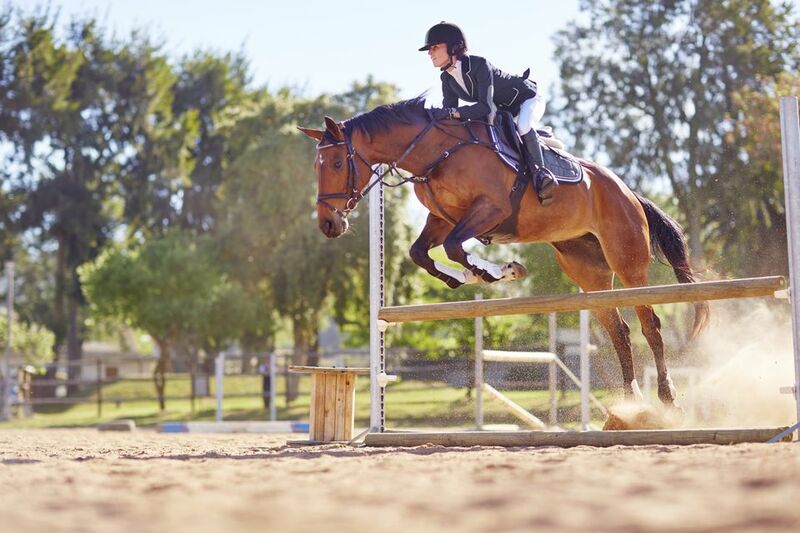 Horses that are used for jumping, dressage, racing, reining, and other high impact sports, are more susceptible to arthritis in all the weight-bearing joints, especially fetlocks, knees, and hocks. Equine arthritis can affect any joint in the body, including the knees, shoulder joints, neck, fetlocks, hocks, back, and stifles. The fetlocks, knees, coffin (within the hoof), and hocks are most commonly affected. These are all weight-bearing joints. The goal of any treatment is to reduce the inflammation in joints, relieve pain, and slow the cartilage breakdown. There is no cure for arthritis at this time. If you notice that your horse is having any discomfort (even discomfort that wears off quickly), it's a good idea to consult your vet. You may be able to identify arthritis early and slow its progress with drugs that reduce inflammation. Stem cell therapy is also possible, although a more costly alternative. While cartilage transplant and other therapies are now possible, they are costly and the outcome is not guaranteed. Because arthritis is a common problem, research into its exact causes and more effective treatments is ongoing. Some people have found herbal preparations to be effective for relieving discomfort, but it may not be wise to use them without consulting a veterinarian. In addition to veterinary treatment, a reduction in workload may be necessary, especially if the work includes jumping, traveling over hard terrain, or other activity that over-stresses the joints. This may mean the end of a horse's competitive career, although light exercise is important to maintain joint flexibility. At times when the horse may be lame, it should not be ridden. Keep the horse on soft footing, with extra, but not excessive bedding that may be hard to walk through. Proper trims and shoeing by a knowledgeable farrier may also be helpful. Younger horses can become arthritic with something called septic arthritis, which is difficult to treat. Antibiotics must be injected into the joint capsule to combat bacterial infection. Irreversible damage may be done to the joints of a foal once septic arthritis has occurred. Arthritis, to some degree, is almost unavoidable in older horses. Horses with conformation faults may put extra stress on joints, yet another reason why breeders strive for foals with good conformation. Proper hoof trims and shoeing, good conformation, providing good footing, while also providing good basic maintenance, can also help to delay the onset of arthritis.